Eleuthera, Bahamas, May 11th, 2017: The Bahamas Agriculture and Marine Science Institute (BAMSI) through its programme to establish greenhouses throughout the Southeastern Bahamas has erected a greenhouse in Hatchet Bay, Eleuthera at the site of the packing house. 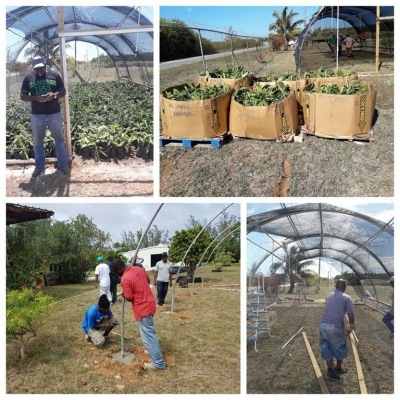 The greenhouse on Eleuthera commences the setup of the greenhouse network in order to bring new technologies and husbandry practices to the farming communities of the Southeastern Bahamas region. The production system in this region has been centered around pot-hole farming, an indigenous system of food production which is labor intensive. The high cost of farm labor in The Bahamas has negatively impacted the competitiveness of food production in that region of The Bahamas. The greenhouse network will provide farmers with vegetable seedlings and orchard crop planting materials via technologies like tissue culture thereby substantially reducing the cost of planting material to the farmer or agribusiness. The initial stock of planting material for the Hatchet Bay greenhouse will be banana meristems which are being shipped to Eleuthera from the BAMSI nursery stock in North Andros. The meristems will be headed and distributed free of charge to Eleutheran farmers as suckers. In recent years, banana production on Eleuthera has been dramatically reduced. This introduction will revive production. In conjunction with the introduction of planting material, new banana husbandry practices will be introduced through the Institute’s Associated Farmers Programme (AFP) and the banana expert stationed in North Andros. These new technologies will lift banana output from a subsistence/small farmer cash crop level to a commercialized level whereby Eleutheran grown bananas will compete with the imported banana brands like Chiquita and Dole. The next locale for banana distribution is Long Island, another traditional banana producing area in our archipelago that has experienced a serious decline in output, particularly sugar bananas. This new infusion of banana suckers into Long Island will ignite production. Climate Change has had a retarding effect on banana production in Andros. Cold winter nights and unseasonable rainfall in conjunction with Hurricane Matthew have almost wiped out production. This has made it essential to reestablish banana production in the Southeastern Bahamas region, so as to ensure a continuous national supply of bananas throughout the year, by encouraging production from the different regions in our country. The greenhouse network will enhance production not only of bananas but also a range of fruits and vegetables.